JSoccer Magazine Issue 8 is on the Way! 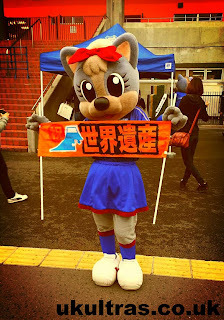 Thank you for your interest in JSoccer Magazine and Japanese Football! Some days it's an absolute pleasure to be an S-Pulse fan, and yesterday was one of them. The result, the fact it came from a team with an average age of just 22, and that I was lucky enough to watch from the VIP room, combined to make it a day to remember. Roy Keane would have loved it. Sushi, sashimi, noodles, sandwiches (none prawn, sadly), roast beef, all on a help yourself basis, and set off with a free bar. It was my first time watching from within air conditioned opulence, and I could definitely get used to it. Missing both Jong a Pin and Bare, it was again something of a juggling act, but we responded perfectly. Sugiyama dropped back to defence again which of course has a knock on effect. Débutante Musaka, who took to midfield, asserted himself well and everyone can be proud to have sent a decent Sendai team home pointless. Hats off to Kushibiki, who has done a good job in goal in the league cup and displayed safe hands throughout. Both goals demonstrated different strong aspects of our play, the first with lightening passing in a tight spot breaking open space for a cross which Kawai met. The second was a speedy counter, and credit where its due to the linesman. It was a tight call, but the run was timed perfectly. I've lost count the number of times I've seen them wrongly called offside, but the judgement was spot on, and Takagi, with his old strike mate Genki Omae watching in the stands, grabbed his first goal of the season by calmly slotting home through the keeper's legs. We now enter the mid season break, the J. League starting back up again on July 6th. We sit 9th, but we can do better, and we know it. 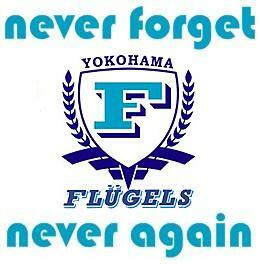 After the recess, we'll be able to start a full strength team in our first game away to Nagoya. They're having a rough old time of it right now, so we can go into it with every confidence. Kachiloko, with special guest Genki Omae. It was great to see him. As we were already out of the competition it was a good chance to start a few young faces. Fujita in defence impressed especially with tireless work rate and was everywhere in the first half. 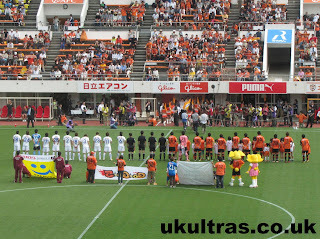 We lost 2-1, which was a decent result against a full strength Yokohama with everything to play for. Should have at least ended in a draw this one, and but for two pieces of wretched luck it would have done. Our Nabisco Cup dream came to an end with defeat to Shonan. Shonan themselves were already eliminated, so the result leaves the qualification between Kawasaki and Iwata. Yokohama are already through to the quarter finals. Well, onwards and upwards! 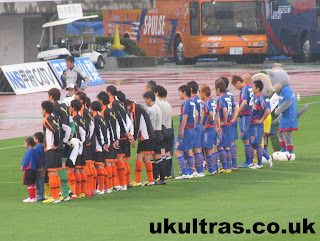 League game on Saturday away at FC Tokyo. Remember last year? Rarely a dull game at the Ajinomoto between us two. I won't be there sadly, but will be watching and live tweeting my usual highly impartial ranting and raving. OK, we'll get the moan out of the way first: Chuo Bank Stadium is an awful place to watch football. Kofu's nice, the local food is top quality and the area around the ground is as scenic as it gets, but the stadium itself is a nightmare. Miles from the pitch, no roof, and not even any cover behind the stands. I mention this because it rained. All day. Right, enough whinging. 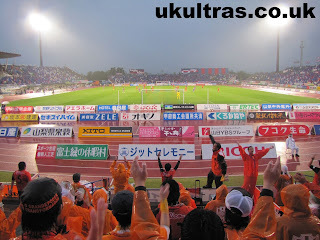 That was a cracking away day topped off with a hard fought victory against a decent Kofu side. It was a game of having to adapt. 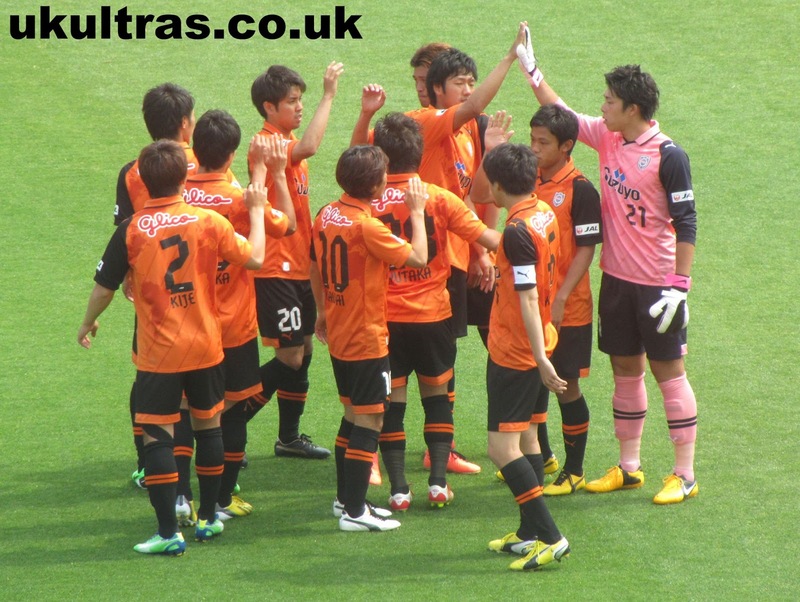 From the outset we were still without Jong a Pin, and we also had to contend with an early substitution for Takagi. His hamstring was giving him issues so Ito took over just half an hour into the game. Then on 72 minutes Ortigoza threw himself over under zero contact from Hiraoka, and Yasuhiro saw a straight red. The Kofu forward was through on goal, but the ball was getting away from him. He knew it, he took the dive, and the ref was fooled. Very harsh on Hiraoka who is the last player to take someone down that cynically. It was a tough game in the wet conditions, with the home team hitting the woodwork at one stage. My recollection isn't the greatest, in main to the poor view. The running track meant not a great deal beyond the halfway line was discernible with any accuracy. Fortunately for the travelling masses, both our goals came down our end, the first in the unlikely form of a Lee Ki-Je thunderbolt. Pressing up on the left, he picked up the ball and instead of going wide was allowed space to cut inside. Approaching the box he saw his chance and crashed it home. The red for Hiraoka came with twenty minutes still to go so we were set for a long final quarter. It was looking like going as you'd expect with the wind firmly in Kofu's sails, but a lightening counter attack won the game. All credit has to go to Yoshida who, in not only preventing a corner, pushed it high upfield to Sho Ito was was right on top of it. Remaining on his feet after a clumsy challenge, the ref played a good advantage, which allowed Sho to lay a perfectly weighted ball off to Bare. Our view couldn't have been better as the Brazilian bore down on the keeper before placing it home with all the calmness in the world. The two goal cushion left Kofu deflated and ensured a comfortable conclusion to the game, even one man down. The win continues our excellent form on the road and is a good response to the two defeats last weekend. After the kachiloko, in which the last two hours standing in the rain was forgotten, we left the free car parking (nice one, Kofu!) and headed for celebratory houtou. Houtou is some of the best warm-you-up food in Japan / Asia / the world, and if you're ever in the area you simply have to try it. 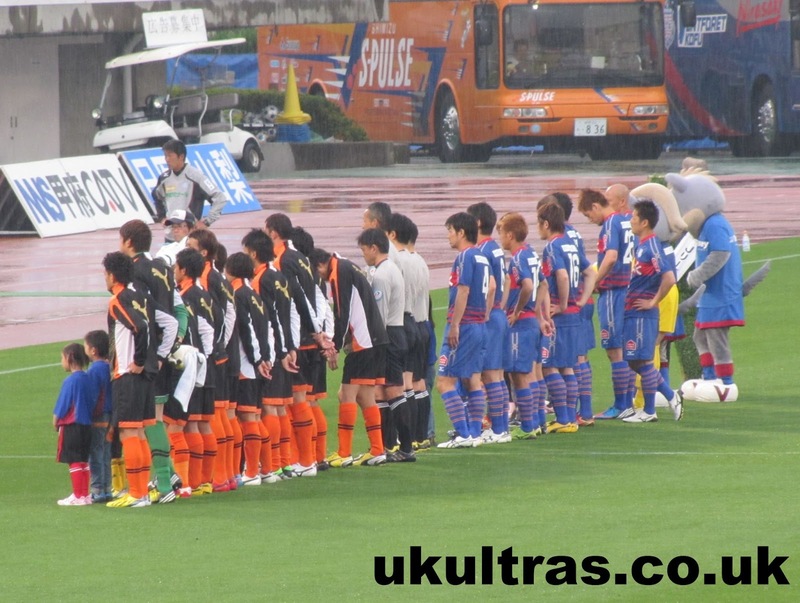 The games keep coming thick and fast this month, and next is Shonan in the league cup. Shonan are already eliminated with two group stage games still remaining, whereas and a win for us would leave us one game from qualification for the quarter finals. Wednesday, 7pm at Nihondaira. See you there! Alright, darlin. What you doing after the game? It was with interest that I noted the 20th Anniversary Game banner splashed across the J. League website. Urawa Red Diamonds v Kashima Antlers. Uninspiring choice, I thought. Guess this must be part of a series of celebratory games, I thought. On further inspection, I was wrong. This is it. One game, out of a weekend of 20. One game, out of a season of hundreds. So why this particular match? One half of the line up is obvious. The other, not so much. Kashima Antlers: Seven time league winner, five time J. League Cup winner. Urawa Red Diamonds: One time league winner, one time J. League Cup winner. So why Urawa of all teams? These two did build up something of a rivalry over the late 00s, but aside from that what is there to lift this game from the pack? Not much. For one, Urawa can hardly claim to be the best team in the country. Hell, at the time of writing they’re not even the best team in Saitama. I read that they were selected for their support; the highest 14 years from 20. Six years it wasn’t, and two years it was the lowest, but never mind that. Recently it’s been the largest. But is that it? Is that really the best they could think of? A flimsy piece reasoning at best, and at worst, pure laziness. If we must pluck just one league game for this landmark event, I can easily think of some more fitting ways to mark the occasion. First off, there are several teams with a more impressive J. League record than just getting bums on seats. Yokohama F. Marinos have three titles and a league cup to their name. Jubilo Iwata have three league titles, along with two league cups. If we want to get more symbolic, while the first champions versus the current would have had a nice symmetry, Verdy Kawasaki are otherwise engaged in J2 with a new name. So why not last year’s champions versus the Kashima? Any of the above, while better, would still bring with it one major issue. Who’s going to watch this flagship match? Not most of the country. They’ll be on the way home from their own games. Even if it was played on its own special day would they bother? Impossible to say, but personally? Nah. What is even set to happen on the big day? Kashima get a round of applause for winning the league 7 times? Two teams take the plaudits on ever one else’s behalf for twenty years of football? Was it honestly a case of simply picking the nicest, easiest to get to stadium from Tokyo so the big wigs can have a pleasant evening and be out in Roppongi by 10pm? I'd hope not, but why else then would it not be staged at the home of the most successful team? 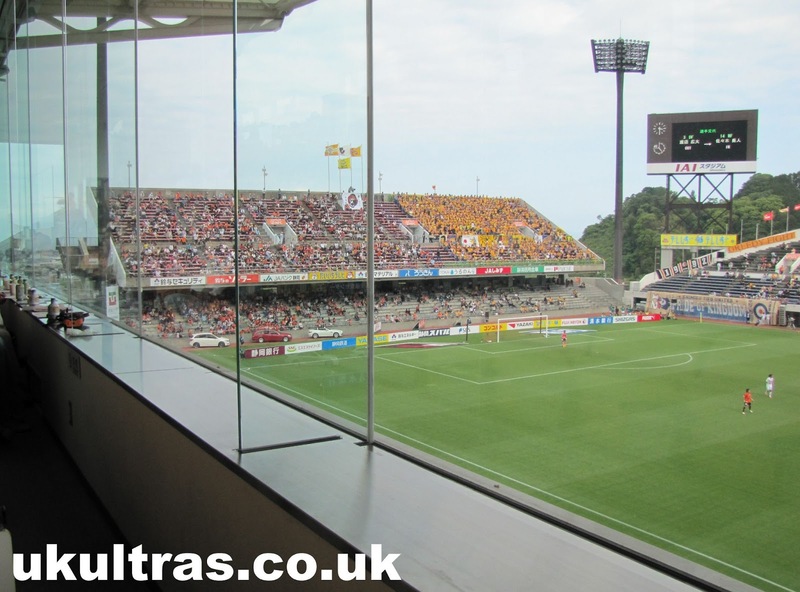 Congratulations Urawa, you were chosen for your access and your arm rests. A better way to mark the 20th year of this great league would be, instead of commandeering a regular game, to have a proper exhibition match. Kashima XI vs J. League Historical XI? Or maybe a good old fashioned East vs West. Perhaps that was all too much work, so hijacking a run of the mill league match and running with that was the easiest option. Hogging all the fun for one league game does seem selfish. What should have been enjoyed by all is closed to all but two teams; two sets of fans. For the other 38 J. League teams and their supporters it ensures the whole rigmarole becomes a complete irrelevance. An landmark which should have been enjoyed by all will pass us by, the opportunity for something memorable lost. Here's hoping the 30th Anniversary Game won't be a similarly fluffed affair. That was an at times brutal game. The referee seemed unable to control some of the challenges flying in, and when he did produce a yellow for Yoshida, it was long after he'd let the challenge go and only when the linesman had signalled. Something else that wound me right up was the ref's waving for someone (who?) to kick a second ball off the pitch. It had been thrown in from the stand and was in the upper corner of the pitch - the same as the ball that was in play. Long story short, Kawasaki's second goal came not long after. Nobody was sure who should kick it out, you could see players wanting to move and hesitating, and eventually one of ours had to move out of position to do it. The ref made the wrong call and it effected the game. Not making excuses for a loss, but it was a big one. We didn't threaten Nishibe enough and need a result away at Kofu on Saturday. Anyway, I need a good sleep. A busy Golden Week, and back to work tomorrow. After last weekend’s trouble at Urawa v Shimizu I found myself, against my better judgment but with morbid fascination, sucked in to YouTube’s comments section. While it was the inevitable car crash of bitching and name calling, I also picked up on a recurring theme of discussion. It was at once fascinating but ultimately disturbing. 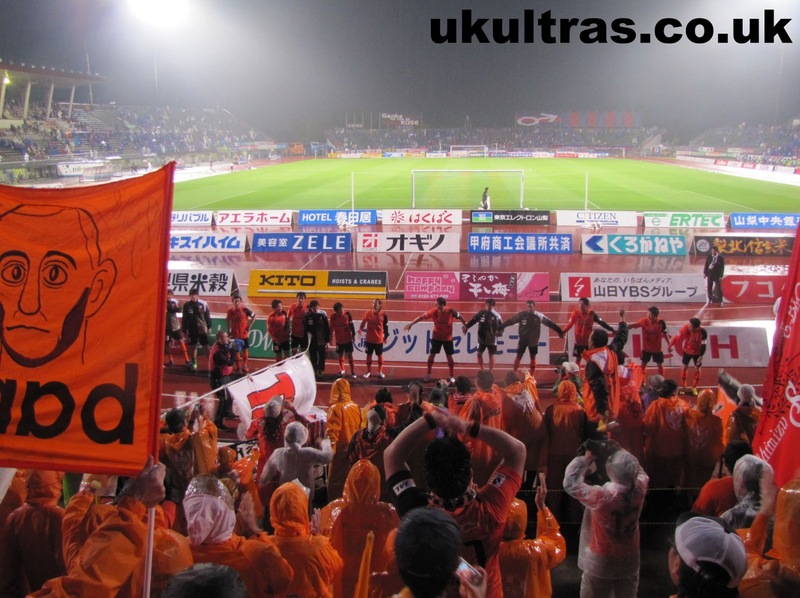 A number of comments sympathising with the Urawa cause, while predictably attempting to shift the blame, were at the same time suggesting Shimizu supporters not only caused the initial exchanges, but actively ensured their escalation. To recap, shortly after S-Pulse’s traditional post game celebration, several Urawa fans arrived next to the away enclosure shouting, gesturing and demanding an end to the festivities. In response, a chorus of Kingdom Shimizu rang out. 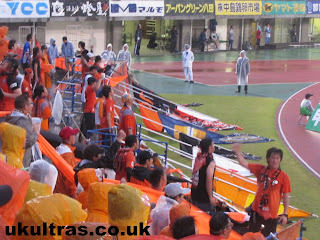 After the majority of S-Pulse fans had left the ground, 150 home fans blocked a remaining group of fifty in the stadium for over four hours. 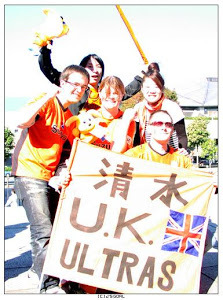 The reason given in holding these people captive, one frequently repeated online since, is that S-Pulse supporters were “unreasonably happy” in their celebrations and as such failed to respect the home team. No, you read that correctly. Unreasonably happy and failing to respect the home team. 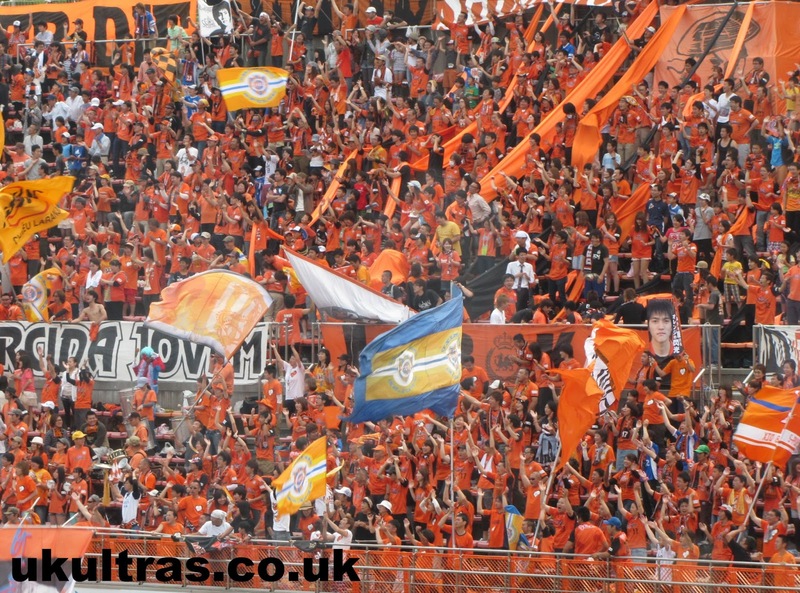 Perhaps the home supporters are uniquely thin skinned, but the travelling support did nothing most normal people would consider as a display of disrespect. Two different chants were sung, neither mentioning Urawa. 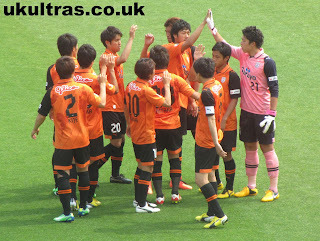 The first, the regular post win victory dance, the second Kingdom Shimizu. 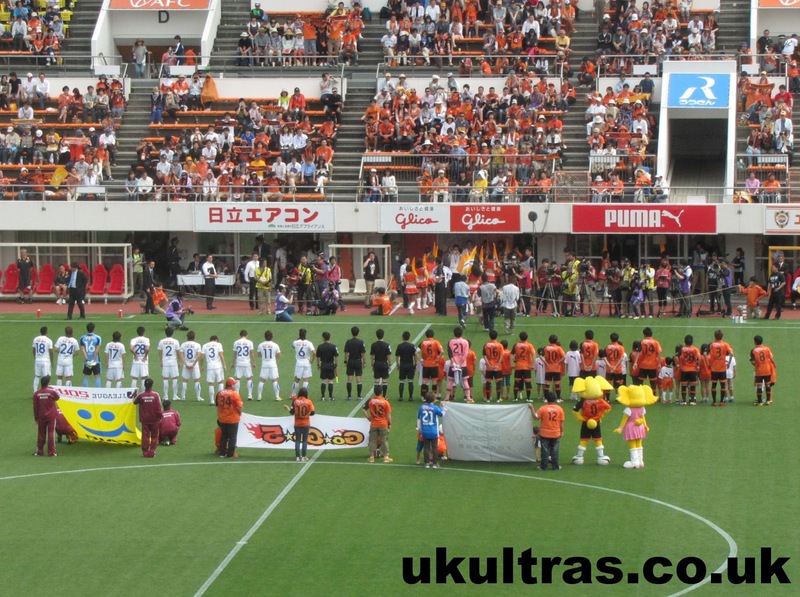 Kingdom Shimizu is a song which gets an airing after beating Urawa, an area traditionally rivals when claiming the heart of Japanese football, or local rivals Jubilo Iwata. 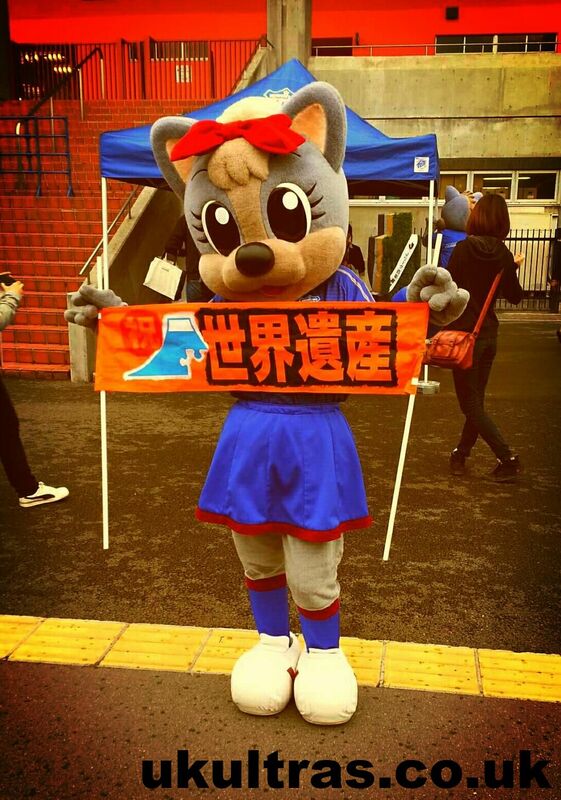 Genuinely showing disrespect could have taken the form of obscene messages aimed at the home team (as Kashima once did against Urawa), damaging the home team’s flags (as Urawa once did at Nihondaira), or taking the singing outside the stadium. Any of these would have been an act of aggression, but none of these were the case. In approaching a jubilant away end demanding silence, was there ever going be an outcome other than heckling and a second rendition of Kingdom Shimizu? Not on this planet. The travelling hoards acted as any football fans should, and a minority of home fans had a temper tantrum. 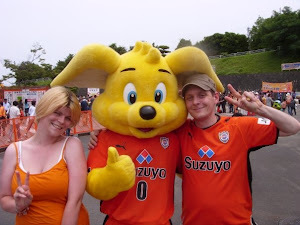 Returning to the argument levelled at to Shimizu fans, if you follow that particular logic it leads us on to some very shaky ground. Home fans blockaded the away zone because they were unhappy, firstly with the away fans’ delight at victory, and subsequently at their refusal to be quiet. Pretty spurious grounds by which to forcibly restrict people going home you may think, and you would be right, but who was there to stop them? Nobody. For four hours the issue went unresolved. No police presence was brought in to remove the law breakers and free those trapped. The reality is you can’t put any restrictions on any supporters’ freedom, and if you try to you can kiss all atmosphere goodbye. Violent or genuinely inciteful behaviour aside, booing, cheering, making a row over the home fans, and most of all NOT shutting up just because your opponents may have hurt feelings are essential to any free and fair football stadium. If after victory Urawa decided to mimic S-Pulse’s victory song I’d say fair play, you’ve earned your moment, enjoy it as it’s your right, rubbing our faces in it as you see fit. There is nothing else you can say. The actions of those on Saturday were juvenile in the first instance, but doubly perverse has been the attempts to justify them through ambiguous and loaded, but ultimately meaningless, language such as respect and offence. That the police didn’t disperse the wrongdoers validates mob rule as a method of crowd regulation, and unless the J. League, still silent on the issue a week on, come down on the ringleaders, not only will the door be thrown wide open for repeats, but a standard will have been established: Our stadium, our rules. Do as we say or accept the consequences. That is, in effect, anarchy, and obviously not a route the J. League wants to start down. You can't take the effect and make it the cause.